Omni 600 is the ‘General Purpose’ Masking Tape. This tape is the most commonly used type of masking tape that overall has excellent performance for painting and masking applications. This is an easy-to-tear tape that has been designed for masking off while painting. This single-sided paper tape has been created to assist with simple jobs such as stencilling, painting, edging, and surface protection. The tape is widely used for decoration purpose in households. This masking tape has a premium rubber solvent adhesive. The tape can be easily removed 30 hours after application without leaving residue of the surface. Masking tape has been designed to withstand up to 60-degree Celsius temperatures and is suitable for use in various conditions. General Purpose Masking Tape gives optimum performance, making it popular in various industries. 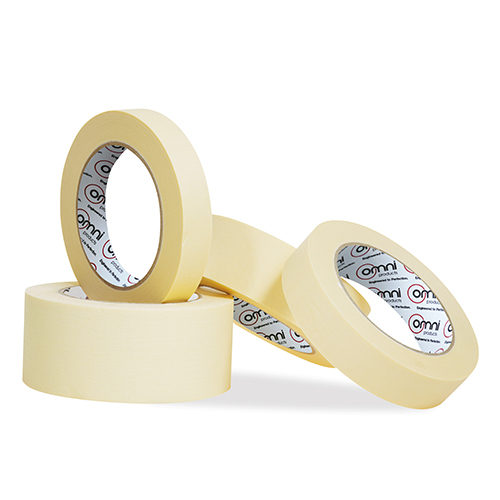 Manufactured in Italy, Omni’s General Purpose Masking Tape is premium quality and has been engineered to perfection. This Masking Tape is available in a number of different sizes. Omni has inhouse tape slitting machinery so masking tape can be custom made to any required width.